Your Pipeline is a forecasting tool used to show projected sales over time. When you add a deal you must assign a percentage as to the probability of closure. 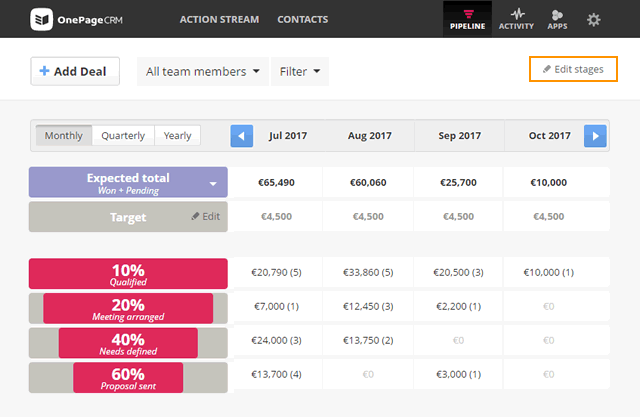 This data is crucial to place a deal within the sales funnel and track its progress until it's won or lost. In the Add / Edit funnel stages pop-up → click on the '+' icon to add a new stage → type the probability percentage in the % column and the stage name. To hide the Won Column tick Hide. 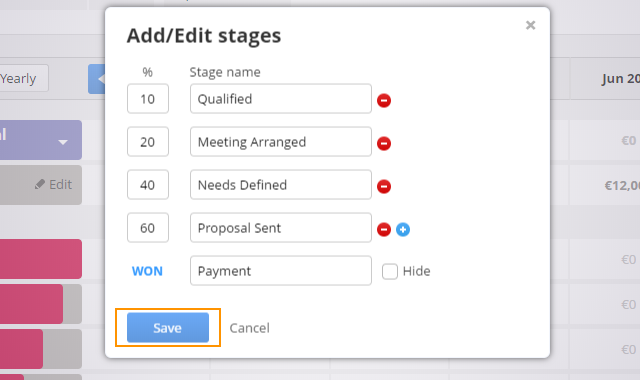 In the Add / Edit funnel stages pop-up, click on the minus icon to delete a deal stage → click Save. Existing deals from a deleted deal stage will be moved to the closest equivalent stage. 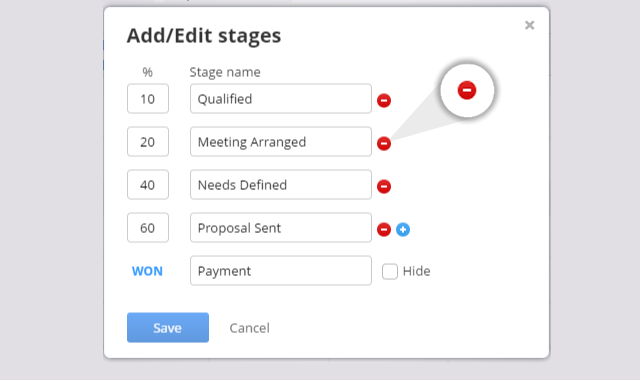 Deal stages can be customized by the Account Owner and/or Admin. You have the option to create nine deal stages. The Won column will display recently Won deals. You cannot have duplicate deal stage percentage (%) values - each stage must have a different value. When you enter a deal stage percentage (%), it will automatically be ordered from lowest to highest. For example, if you add a new % of 60%, it will order itself in-between 50% and 75%.